we get it: you love the holidays. Well, you’re in good company. Because we do, too! At Village Treats, we have our annual favourite holiday chocolates, especially when it comes to Christmas, Valentine’s Day, Easter and Halloween! We use our custom molds to create some cute chocolate designs! We’ve got Santa Claus, Lumps of ‘Coal’, Snowmen, Pumpkins, witch pops, hearts, bunnies, lambs and more. Perfect for stocking stuffers or present toppers. Not only do we pride ourselves on our chocolates, but also our presentation. Our boxed chocolates are a popular purchase, especially within the retail market. It’s the perfect host gift for a dinner party, work event or a weeknight Netflix binge session (hey, we don’t judge). 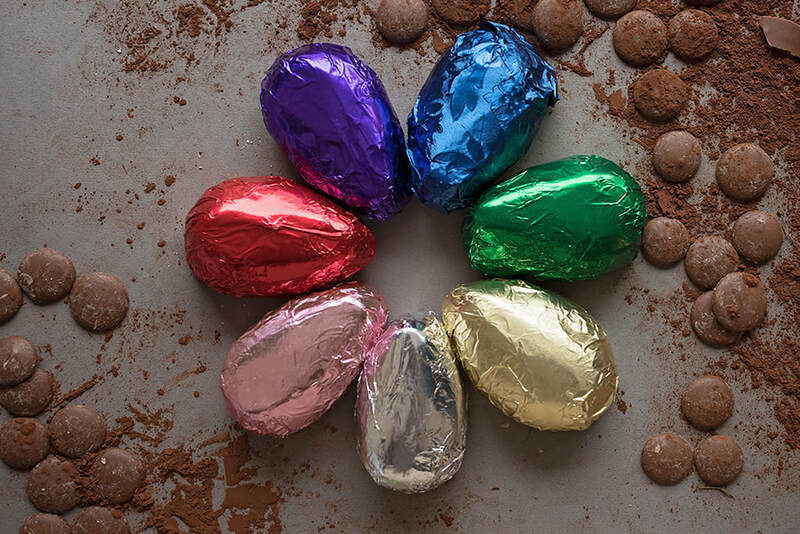 Our Easter Cream Eggs have proven to be one of Village Treats’ biggest successes; every year, we make thousands of our delectable Easter Cream Eggs for social events, fundraisers, and for Easter shoppers at our outlet store. Each cream egg has a creamy, melt-in-your-mouth interior that can be enrobed in Milk, Dark or White Chocolate. Flavours include, Milk Chocolate Bordeaux Cream, Milk Chocolate Peanut Butter, Dark Chocolate Butter Cream, Dark Chocolate Mint Cream, Dark Chocolate Coconut, Milk Chocolate Fudge, and Dark Chocolate Maple Cream. Want to fundraise these goodies? Contact us at the Village Treats Outlet store for fundraising opportunities. Filled with barks, brittles, candy canes, Holiday boxes and molds-you name it. Just name a price range ($10-$150) and we can make you up a Holiday basket that would make the perfect gift to any chocolate lover.